When I was in Washington in 1964-1969, I got to know an economist named Frank Schiff. I just found out that he died this month six years ago. His obituary was in the Boston Globe. My reason for noting this right now is that a friend of mine in Boston is trying to trace Frank's brother Ray (aka Reinhold) Schiff. I thought I would use my blog followers to see if anyone could help. PSEG advances on its communities like a wild rhino. The PSEG PR fiasco in East Hampton raises the question: "Was this PSEG's first rodeo?" No, PSEG has been battling complaints about the poles in New Jersey a year ago and in the middle of Long Island at the beginning of 2014. Based on its record of the past year, PSEG seems to take the view that its job is solely to expand the electricity-transmission capacity of New Jersey and Long Island, NY and this job gives it the right to override and transcend all existing local rights, regulations or responsibilities. Used poles treated with Penta (a "probable carcinogen", according to the US EPA). Perhaps worst of all, proscribed local first-responders from touching the wires, thus impeding their ability to reach victims in emergencies and risking week-long delays in providing emergency services in hurricanes and storms. Herewith a few pieces from the growing record of community insults. The town needs to do more to rectify this situation. These poles need to be taken out. An eyesore to most, but they are more than just that, they are monstrosities. ... They’re twice the size of our houses. They could fall down, number one; number two, they’re not zoned to be that high, they should only be 35 feet. PSEG was given a green light by the NJ Board of Public Utilities in Trenton to install the taller, higher-voltage utility poles. 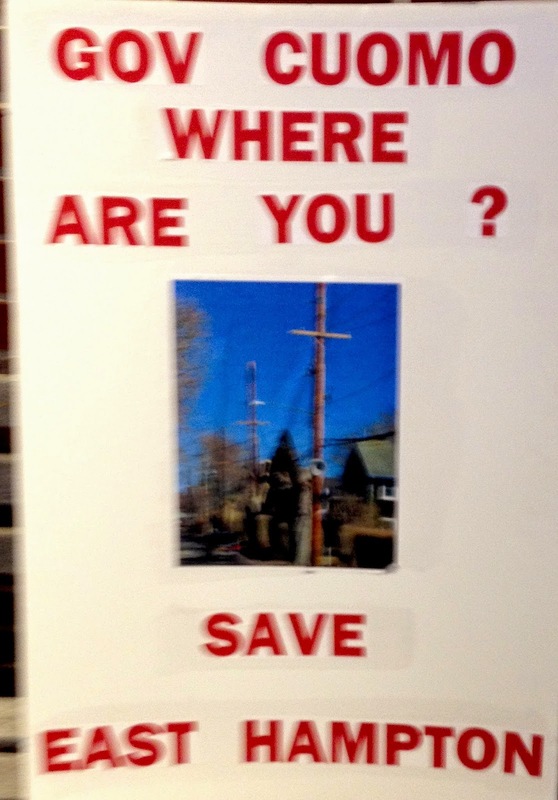 The Village of Ridgewood, NJ, had asked for the project to be halted because PSEG did not provide advance notice, was using higher-voltage lines without regard to the increased hazards in an emergency, and would lower property values in a community where the median home price exceeds $700,000). I don’t see the health and safety concerns. PSEG spokeswoman Karen Johnson said the cost of burying the lines would be too high. In the wake of the decision, Ridgewood's Mayor said he was disappointed, and reiterated his call for underground lines: "The increasing frequency of destructive storms combined with the increasing demand for electricity suggests that the 'business-as-usual' approach — more poles with higher voltage — must be revisited." BPU President Hanna observed that during Hurricane Sandy and other storms, NJ utilities had already been criticized for failure to update customers about mass outages. PSEG never secured required road permits from the Village of Ridgewood. BPU Commissioner Joseph Fiordaliso said: "We’re not talking about rocket science here. You can short-circuit a lot of problems by communicating ... to the municipality and to the individuals who are going to be directly affected." PSEG spokeswoman Johnson promised to communicate better in a November 2013 email: "This experience has reinforced to us the importance of communications with the communities in which we are building and upgrading facilities. We ... will continue to look at ways to improve the process to better assure that communities understand the rationale for projects and to allay any health and safety concerns in advance." It’s horrible. The issue is do it the right way, and give people the chance to pay... before you start putting it up. Utilities can use public rights of way and may resort to eminent domain. Gerald A. Norlander of New York’s Utility Project, a consumer advocacy group said: “They can take a site and do what they want." The NY state Department of Public Service can place limits, he said. As a result of community opposition, the Governor’s office has asked DPS to review the project. The taller poles are stronger and more resilient in storms than the older poles, said David M. Daly, PSEG-Long Island's President and CEO, to a restless town meeting in Port Washington. The lines, he said, could be buried later, but that could cost millions more, and costs would be passed on to customers. He said: "There is no option to stop the project. ... You can do anything you want, as long as you want to pay for it." It seems to me that burying the wires is something that could qualify, and we plan to make a strong case for that. In January, PSEG began installing a 23/33 kV transmission line and 267 of the 70-foot long and larger-diameter utility poles to cover six-and-a-half miles of transmission from East Hampton Village to Amagansett. The project was described as an "upgrade" to provide "reliable" and "redundant" electricity under storm conditions. PSEG Long Island called a public hearing yesterday evening on the Utility 2.0 Long Range Plan. It was an opportunity lost. 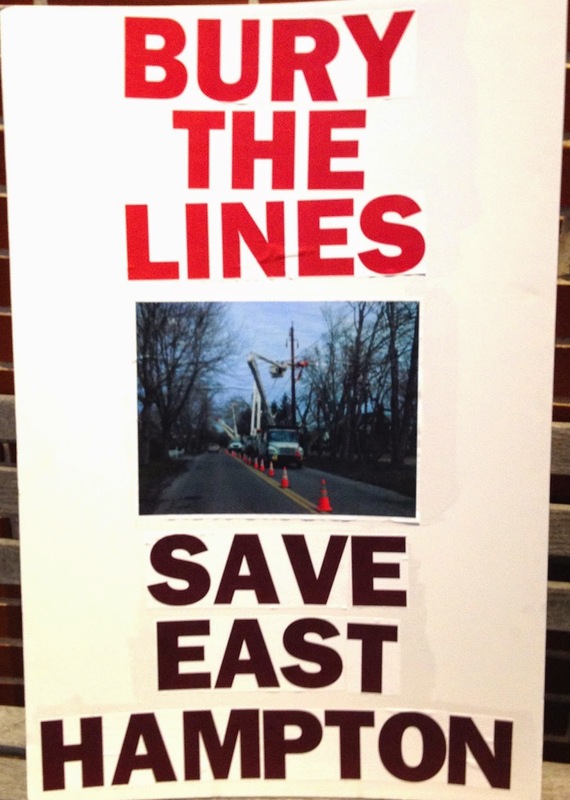 Local residents such as eco-warrior Debra Foster organized Save East Hampton around the “Bury the Lines” issue, and used the hearing as their platform, complete with a couple of dozen supporters wearing orange tee shirts emblazoned with their slogan. Even though the "Bury the Lines" group hijacked the hearing, they were not disruptive. They were quiet and respectful for an hour, giving the representatives of the PSEG and the Governor and NYS Public Service Commission (which has only advisory powers over Long Island) a chance to repair relations with the East Hampton community. No such luck. The respect was not returned. The PSEG spokesman left, although reportedly there were two other PSEG employees hiding in the back. It was an opportunity lost, except for the possibility of a published record with excellent speakers on the Utility 2.0 Plan, such as East Hampton Supervisor Larry Cantwell, Assemblyman Fred Thiele, Frank Dalene of the Energy Sustainability Committee (ESC), and Gordian Raacke of Renewable Energy Long Island. The meeting was structured in an unforgivably cynical way, taking up the whole first hour with a slide show. The big issues were buried with minutiae in which no one had any interest. (The best place to hide a book is in a library.) The slide show could have been announced as available on-line, and the PSEG spokesman given the same four-minute limit that community representatives were required to keep to. Sure enough, the hall was emptied out by 8 pm, leaving no audience for many of the 50 people who signed up to speak; some are planning and environmental experts with real contributions to make. I know two well-informed people who were at the meeting before it opened at 5 pm, to sign up to speak, but couldn't. They had to leave for dinner by 8 pm, before they were called. PSEG is the latest catastrophe in a string of disasters, beginning with the one that brought down the venerable Long Island Lighting Company (LILCO), founded in 1911 by Ellis Phillips, an engineer. LILCO built the Shoreham Nuclear Power Plant. I was at Shoreham with my wife Alice in the 1970s, protesting the folly of nuclear power in an area where there was no escape in the event of an emergency. Public pressure brought to an end to Shoreham in 1989, under Governor Mario Cuomo. The plant was dismantled and LILCO ended. So anyone who thinks that taking down some 70-foot poles is an impossible dream should remember Shoreham. A lot of people involved in the anti-Shoreham campaign are still around - Steve Latham, for example, of Twomey, Latham et al. The assets of LILCO were purchased by the Long Island Power Authority (LIPA), a public authority, which issued debt to buy them. LIPA still owns the utility assets on Long Island along with the debt. But the pesky problem of actually providing electricity to Long Island residents has been contracted out, first to KeySpan, which became the National Grid, and now to PSEG, a Newark-based electric utility. If Long Island customers got an electric bill from Scam, Inc., they would probably pay it. Standing room only. Big crowd of more than 200 people unhappy with PSEG and the Governor. Photo by JT Marlin. The problem is that good-cop LIPA makes environmental commitments to customers that bad-cop PSEG then makes fun of. PSEG's customers in the Town of East Hampton finally got a hearing and were eager to express their distress at PSEG's trampling on their right to due process by installing high-voltage transmission lines on new 70-foot (says the NY Times - described in some places as 65-foot or even 60-foot) poles. More than 200 people attended, says Newsday, a big crowd - elderly people had to stand for more than an hour until the crowd thinned out, even though Village officials brought out many more chairs. I don't think anyone went out of that meeting with the feeling that Albany cared yet what they think and that the treatment of the community would immediately change. But those who might have wondered whether this might be a lot of fuss over nothing, like maybe me, could only have come out of the meeting with a sense of betrayal by PSEG and, yes, the officials who are supposed to be keeping PSEG in check. These are the times and places that create a local Henry ("Braveheart") Wallace or James ("Black") Douglas, leaders of Scotland's successful fight against a then-imperial London. This despite East Hampton's being celebrated in the Governor's Comprehensive Energy Vision as a leader in Renewable Energy and Energy Efficiency. PSEG introduced itself to East Hampton with what one organization's spokesman called "an atrocity", installing nearly 300 ugly and dangerous poles in defiance of local laws and traditions and feelings. before the excellent string of four-minute public comments. PSEG's "Utility 2.0" plan, which was the reason PSEG called the meeting, was slammed by Gordian Raacke of Renewable Energy - Long Island (RELI) as "Not 2.0, more like 1.1". It lacks detail. The information that it does disclose, like building seven new fossil-fuel power plants on Eastern Long Island, defies decisions by local residents. East Hampton has pledged itself to be 100 percent independent of fossil fuel by 2020, and 100 percent dependent instead on renewable energy - solar, wind, geothermal, batteries. The public hearing yesterday was an outrage. PSEG's representative took up an hour of time with a recitation of mostly irrelevant facts, then fled the scene instead of showing a scintilla of respect by listening to the well-prepared four-minutes-or-less statements of 40+ members of the public. Next time, he or his successor should be given no more time to speak than members of the public. The poles are hideous. They are like black teeth in the Town Lane smile. Due process was not followed. As Town Supervisor Larry Cantwell said, LIPA administered it own 30-day review process without regard for any environmental regulations. There was no proper environmental impact study of the 6.5 mile transmission line. Quoth Mr. Cantwell, "Never again." He means it. Kathleen Cunningham of the usually staid East Hampton Village Preservation Society was up in arms over the bypassing of local planning procedures. The transmission lines will carry higher voltage than anyone is used to. If (when) the trees fall and bring down the poles, the high voltage will bring traffic to a standstill. Will PSEG personnel be ready with trucks to remove the poles and high-voltage wires, since no one else can? The new poles create huge emergency-service problems. The transmission lines go right past the East Hampton Village Emergency Services Building where the meeting was held. In another storm, the transmission lines could block vehicles from leaving the building. How is PSEG going to get to fix the lines? This is a crisis waiting to happen, with anyone in East Hampton being a possible victim of the lack of services. Some of the 60-foot poles are 20 feet from homes. What will happen to the homes when the high-voltage wires fall on private homes? The poles are treated with a toxic chemical, Penta, that is banned in the USA for any use but utility poles and railroad ties, and is about to be banned by treaty in 211 countries as a probable carcinogen. The reason Penta is still accepted for utility poles, according to one comment at the meeting, is that regulators assumed that none of these poles would be installed close to residences with children. The point about toxic poles was new to me. The PSEG poles have been treated with Pentachlorophenol - Penta or PCP, introduced in the 1930s. Use of Penta has declined because its advantages are also big negatives - it lasts for a long time in the environment and is effective because it poisons all kinds of creatures. Its only permitted U.S. use is to preserve utility poles and railroad ties. Utility poles last 35 years with Penta treatment, five times as long as when they are untreated. But in the meantime they release poison into the ground and the air. PSEG workers who put in the poles are exposed to Penta through inhalation and skin contact. Residents are exposed through contact with ground around the treated wood, or drinking water contaminated by Penta through leakage into well-water. Short-term exposure to large amounts of Penta can cause harmful effects on the liver, kidneys, blood, lungs, nervous system, immune system, and gastrointestinal tract. Side effects include elevated temperature, profuse sweating, uncoordinated movement, muscle twitching, and coma. Contact with Penta in the form of vapor can irritate the skin, eyes, and mouth. Long-term exposure to Penta is associated with carcinogenic, renal, and neurological effects and the U.S. EPA classifies Penta as a probable human carcinogen. Penta has been detected in surface waters and sediments, rainwater, drinking water, aquatic organisms, soil, and food, as well as in human milk, adipose tissue, and urine. Gordian Raacke of RELI said it all. Utility 2.0 is really Utility 1.1 because it doesn't take us very far. It's a PSEG construct - and PSEG's CEO has expressed his impatience with the vision of the future that East Hampton has adopted. East Hampton plans for a 2020 future of 100 percent renewable energy, including solar panels accompanied by a system of distributed energy generation. PSEG is focusing on taking control of more of the consumer's energy equipment. Control over the system should really rest with the owner of the system, which is LIPA and ultimately the State of New York. The State's plan is the Comprehensive Energy Vision, in which East Hampton is a model for the rest of the state. It is clear that changes in how utilities are organized are ahead. They have been in the making for decades. But neither PSEG nor New York State has articulated exactly what they have in mind. Now, at the tail end of a series of hearings that Governor Cuomo might have thought would put public unhappiness to rest, the handling of the hearing angered people, like me, who thought of themselves as moderates before the show. How to take all the poles down as quickly as possible and bury the wires. How to make sure that no state agency ever, ever again rides rough-shod over the community the way that PSEG just did. Jeremy Samuelson, Executive Director of the 40-year-old Concerned Citizens of Montauk, who used the word "atrocity" to describe the PSEG move, said that the main message he brought from Montauk is that PSEG needs to come up with $20-$30 million to take down all the transmission-line poles and bury them. If PSEG doesn't put up the money it will have to come from somewhere else. It reminds me of the NYS Urban Development Corporation's eminent domain authority. It was used for an economic-development objective, and stirred up cries of: "Never again." Julia Bovey, Director of the Department of Public Service-Long Island in Albany, is charged with making recommendations to Governor Cuomo. Her first recommendation should be to take out all 267 of the 60-foot poles and bury the transmission wires. Until that happens, expect unhappiness and negative feedback from East Hampton. Canada to avoid paying U.S. taxes? 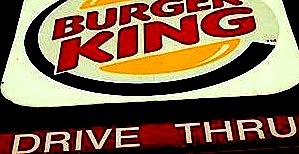 August 26, 2014–Burger King is pursuing the inversion approach to avoiding taxes through moving its headquarters to the home of a Canadian company. The Congressional Research Service reports that 47 American companies have pursued inversions in the last ten years to escape American taxes. Burger King is merging with Tim Horton's (a fine very-Canadian company, by the way - I have eaten there a few times). But I don't think BK is going to have it their way. Consumer-brand-driven companies can't get away with moving their headquarters to avoid (evade?) taxes. It isn't clear that pharma companies can either, when the dust settles and policy-makers figure out how to address the issue. It seems to me the tax benefits of a Canadian takeover cannot possibly match the economic impact of a #BoycottBurgerKing (or #BoycottBK) campaign. There are too many competitors and their margin is too low. The announcement met an immediate backlash on Burger King’s Facebook page. “If you attempt to buy Tim Horton’s for the purposes of evading US Taxes, I will NEVER step foot in another Burger King again,”wrote Facebook user Gabe Gibbons. By 10:30am ET more than 1,400 other users liked the comment, and hundreds replied. On Twitter, users expressed their distaste for the company going abroad with hashtags. The company that is paying the highest percentage of its net income is Exxon Mobil, 42 percent. It sounds like a lot, $24.3 billion, and Uncle Sam and its other taxpayers are grateful. But this is on revenue of $394 billion. If you earned $394,000 last year, you surely would not begrudge the U.S. Government $24,300 in taxes. Would you? The food industry has lower margins. But it is also much more vulnerable to the charge of deserting its own customers... I don't think this flag will fly. I am sorry for the investors, who will find out the implications of the consumer being king. The above information on Effective Tax Rates (ETRs) are for the 15 most profitable U.S. companies (profit = net income). Data from FactSet Research Systems. Mark Thoma has a radical thought - the avoidance of corporate income taxes takes up so much of the time of skilled workers that it represents a huge diversion of productivity away from work that might be more useful to the public. He wonders whether we wouldn't be better off if we just dropped the corporate income tax to zero. This would allow the IRS to tax capital gains and dividends as ordinary income - the double taxation argument would disappear. I think he is onto something. It would certainly be very satisfying to put some people out of business who generate huge fees but don't seem to add social value. Homeless woman sleeping in subway station. August 25, 2014–In December 2011 I posted the following, and it seems now timely to re-post it in the context of the mayoralty of Bill de Blasio. The Eighth Avenue subway stop at 14th Street is one I frequently step out at to switch from the A train to the local E or C train that stops at 23rd Street. The station has many sculptures by Tom Otterness that I often take the time to study while waiting for the next local train. Born in 1952, Otterness has been called the most prolific public artist in the United States. Collectively called "Life Underground", the 100 or so sculptures in the 14th Street station can be viewed as social criticism in harmony with the Occupy Wall Street dichotomy of the 99 percent vs. the 1 percent. The MTA has a video of Otterness's work on YouTube. Otterness, who comes from Wichita, Kan. and has a studio in Brooklyn, is probably best known for these subway station sculptures and in the Rockefeller Park in Battery Park City. Frightened man peering around rail. Many of his sculptures depict the life of the poorest of the 99 percent. For example, the first photo I took was of a homeless woman huddled at the foot of a large riveted beam. The second one was of a frightened man peering around an aluminum fence. Cities can be frightening places. Sculptures of police stand guard over enclosures, or over would-be farebeaters or over large bags of money. Otterness's sympathies do not seem to lie with the 1 percent! The poor are depicted as vulnerable people with children. They are watched over by men in uniforms with sticks at the ready. The 1 percent are shown less favorably. Money-bag-headed shellfish has a family in its claws. They are frequently depicted with a money-bag where a head should be, as in the photo of a giant lobster- or crab-like animal that has captured a family in its huge claws. Looks to me like a post-2008 foreclosure. 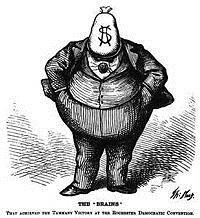 The use of a money bag for a head follows Thomas Nast's portrait of Boss Tweed. Faceless. The police are not portrayed as the villains, just people with a star on their chest doing their job to protect property. Yes, of the 1 percent, but a lot more of the population than that. The final sculpture shows government workers sweeping up the pennies. I puzzled over this one. Are these predatory lenders? That could be one interpretation. Payroll loans? Or, the next thing that came to mind, they could be collecting the payroll tax, sweeping up the poorest workers' pennies... and regressively exempting all incomes above a certain threshold. Government workers sweep up the pennies. Payroll tax? Otterness has done work in many other cities. However, he ran into trouble in San Francisco. The City Government was ready to sign him up to do some work there when local animal-rights activists drew attention to a film he made in the 1970s in which he shot a dog in front of the camera. He has abjectly apologized for the shooting, but it seems to have lost him the San Francisco contract as well as one in Nebraska. It may also have been linked to the Battery Park City Authority's denial of a follow-on contract in 2011. Apart from this long-ago animal-rights offense, which does put his later-life compassion in a new light, I think Otterness has a good formula. He shows urban inequality in a rudimentary way, memorably but allegorically. It's a message that gets lost in the hubbub of people going about their business. And his work does not pillory any group so specifically that anyone can take personal offense. I mean, who would sue the MTA on the grounds that the creature with claws was surely meant to represent him or her? is 10,000 page views in 74 days.